May 6-10 2019, Institut Mittag-Leffler, Stockholm, Sweden. June 4-5 2019, Universität Basel, Basel, Switzerland. July 15-19 2019, IMPA, Rio de Janeiro, Brazil. December 2nd to 13th, 2019, Universidad de Talca, Chile. The Escuela Latinoamericana de Geometría Algebraica (ELGA) series of schools quickly became a major event for algebraic geometry in Latin America working as meeting point for the whole community due in part to the novelty of having some of the best researchers in our field lecturing in Latin America. The goal of this Fourth Edition is again to bring experts in algebraic geometry and present different topics of current research to advance graduate students, postdocs and young researchers from Latin America and other parts of the world. There will be five main courses and several survey lectures in english on a wide range of themes in algebraic geometry and its applications, completed by a series of research talks given by young researchers. A series of Winter Schools aimed at doctoral students and young researchers, co-organized each year since 2012 in Enney or Charmey (Switzerland) with Jérémy Blanc (Basel) from 2012 to 2016. Starting from the 6th Edition 2017, the school is now mainly co-organized by S. Zimmermann (Angers), R. Terpereau (Dijon) and P. Habegger (Basel). 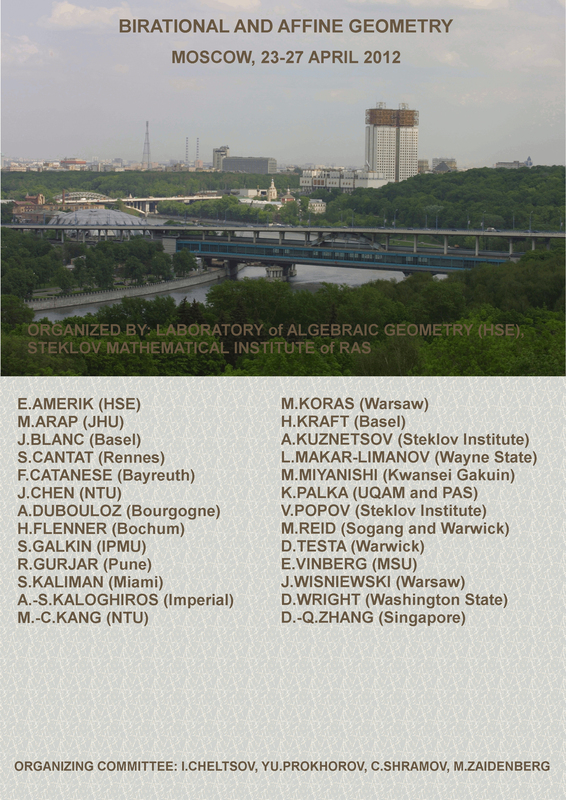 Each edition is centered around 3 mini-courses on current trends in Algebraic Geometry given by invited senior researchers, completed by a series of more specialized talks given by younger participants. A series of joint mini-workshops in Algebraic Geometry initiated with Jérémy Blanc (Basel) in 2015 and held until 2017 on a biannual basis between the Institute of Mathematics of the University of Basel and the University of Burgundy. In 2017, the series became the Basel-Dijon-EPFL Joint Seminars organized with the additional partneship of the Mathematics section of the École Polytechnique Fédérale de Lausanne. The regular meetings are mainly co-organized by Jérémy Blanc (Baseal), Ronan Terpereau and Adrien Dubouloz (Dijon) and Zsolt Patakfalvi (EPFL). 2018-2021. Project ANR-lS-IDEX-OOOB "Investissements d'Avenir". Coordinated by F. Déglise (IMB Dijon). 2016-2019. Project 2015/18/E/ST1/00562 funded by National Science Centre, Poland. Coordinated by K. Palka (IMPAN Warsaw). Research Networks or Projects I have been involved into. An informal (and unstructed !) network of european researchers around the themes of Affine Algebraic Geometry. This network has its root in the French-Swiss study group Automorphismes des Espaces Affines" started in 2006. It progressively grew up into a larger network with broader interests in Algebraic Geometry and its interactions with commutative algebra, holomorphic dynamics and geometric group theory. Its activities temporarily merged with those of the ANR Project "BirPol" for the period 2012-2016. 2011-2016. A team project aimed at the study of polynomial automorphisms of affine spaces and Cremona groups. The project BirPol concerns the interaction of algebraic geometry, commutative algebra, holomorphic dynamics and geometric group theory. The aim is to study the groups of polynomial automorphisms of affine spaces and Cremona groups, that is, birational transformations of projective spaces. These groups have already been extensively studied since the 19th century in classical algebraic geometry, however there are many questions concerning their structure which are still open for dimension three and higher. The study of these two groups has long been conducted separately, guided by varying interests and approaches. However, many recent results, both in algebraic geometry, group theory and holomorphic dynamics reveal a profound analogy between the two subjects both at the levels of known results essentially in dimension two, as in the conceptual and technical difficulties encountered in addressing their study in higher dimension. The main scientific objective is to develop common techniques and approaches allowing us on the one hand to reinterpret and improve the existing results in dimension 2 and secondly to make significant progress in the study of polynomial automorphisms and birational automorphisms in dimension 3. The project team consists therefore of experts from various complementary aspects of these questions (birational projective geometry, affine algebraic geometry, holomorphic dynamics, real algebraic geometry, commutative algebra, invariant theory, geometric group theory), who will collaborate on different aspects to develop new approaches in this research area. 2) the development of a new approach to the moduli space of infinite dimensional groups based on the existing theory of ind-varieties and algebraic ind-schemes. This project also aims to contribute to the establishment of a network of French researchers around the themes of affine geometry and birational transformations. At this time, such a network exists, but it is only structured around an informal Inter-University Franco-Swiss workshop group created in 2006 on the theme of automorphisms of affine spaces. This project will develop the group's activities, promote and distribute its interests and increase its visibility both nationally and internationally. 2013-2015. Project 0382/IP3/2013/72 funded by Polish Ministry of Science and Higher Education. Joint with K. Palka (IMPAN Warsaw). 2012-2014. French-Swiss Project 26470XE. Jointly coordinated with J. Blanc (Basel). 2009-2011. French-Dutch Project 18153NA. Jointly coordinated with S. Maubach (Nijmegen). 2009-2012. Member of the Project ANR-08-JCJC-0130 coordinated by L. Meersseman (Dijon-Angers). A selection of Conferences and Workshops I either (co-)organized, or gave talks at ... or just participated to. Journée I-SITE "Motivic Invariants of Algebraic Varieties"
January 31 2019, LMB, Besançon. March 7-10 2019. Kwansei Gakuin University, Osaka, Japan. January 7-11 2019, Charmey, Switzerland. November 26-30, 2018, Rennes. Invited Speaker. November 16-17, 2018, Saitama, Japan. Co-organized with T. Kishimoto (Saitama) and I. Cheltsov (Edinburg). October 29 - November 2 2018, ICJ, Lyon. October 10-11 2018. IMB, Dijon. Co-organized with R. Terpereau (Dijon). October 24-25 2018. IMB, Dijon. Co-organized with R. Bignalet-Cazalet and D. Faenzi (Dijon). September 4-7, 2018. Bern, Switzerland. Invited speaker. June 17-23 2018. MFO, Germany. May 25-June 1 2018. IMPAN Warsaw, Poland. Speaker. May 3-4 2018. EPFL Lausanne, Switzerland. Speaker. March 29-30 2018, Institut de Mathématiques de Bourgogne, Dijon. Co-organized with R. Bignalet-Cazalet, F. Déglise and R. Terpereau. March 8-11 2018. Kwansei Gakuin University, Osaka, Japan. Co-organized with T. Kishimoto (Saitama), H. Kojima (Nigata) and K. Masuda (Osaka). February 5-9 2018, Freiburg, Germany. Invited Speaker. January 8-12 2018, Charmey, Switzerland. December 18–22, 2017, IBS Center for Geometry and Physics, Pohang, South Korea. Invited Speaker. October 13 2017, IMB Dijon. September 11-12, 2017, Dijon. Co-organized with J. Blanc (Basel). July 3-7 2017, Dijon, France. Co-organized with R.Bignalet-Cazalet, D. Faenzi, L. Moser-Jauslin, R. Terpereau and E. Wagner. June 26-30 2017, Edinburgh University, Scotland. Invited Speaker. May 17-19 2017, IRMAR Rennes. May 9-10, 2017, Basel, Switzerland. March 23-24 2017, Institut de Mathématiques de Bourgogne, Dijon. March 2-5 2017. Kwansei Gakuin University, Osaka, Japan. Co-organized with T. Kishimoto (Saitama), H. Kojima (Nigata) and K. Masuda (Osaka). February 11-17 2017, Institut Mittag-Leffler, Stockholm, Sweden. December 18-22 2016, Hanga Roa, Chile. Co-organized with A. Liendo (Talca) and I. Cheltsov (Edinburgh). December 14-17, 2016, Valparaiso, Chile. November 14-18, 2016, Laboratory of Algebraic Geometry and its Applications, Moscow, Russia. Lecturer. October 24-28 2016, Institut Fourier, Grenoble, France. Co-organized with J.-P. Demailly (Grenoble), H. Flenner (Bochum), S. Kaliman (Miami) and A. Liendo (Talca). October 10-14 2016, Jevnaker, Norway. Invited Speaker. September 18-24 2016, Łukęcin, Poland. Lecturer. September 5-16 2016, Basel, Switzerland. Unofficially co-funded by the ANR Project "BirPol". July 4-8 2016, Dijon. Co-organized with D. Faenzi, J. Nagel, A.-L. Thiel, E. Wagner (Dijon). Co-funded by the ANR Project "BirPol". June 27 - July 1st 2016, Toulouse, France. Co-funded by the ANR Project "BirPol". Dijon-Basel Seminar 2nd Edition, a sequel to the Basel-Dijon Seminar 2nd Edition held in Basel. June 6-7 2016, Dijon. Co-organized with J. Blanc (Basel). May 26-27 2016, Bern, Switzerland. Co-organized with J. Blanc (Basel), A. Ramos and F. Kutzschebauch (Bern). Co-funded by the ANR Project "BirPol". March 5-8 2016. Kwansei Gakuin University, Osaka, Japan. Co-organized with T. Kishimoto (Saitama), H. Kojima (Nigata) and K. Masuda (Osaka). January 11-15, 2016, University of Roma Tor Vergata, Roma, Italy. Invited speaker. Dijon-Basel Seminar, a sequel to the Basel-Dijon Seminar held in Basel. December 14-15 2015, Dijon. Co-organized with J. Blanc (Basel). November 21-30 2015, International Center for Theoretical Sciences, Bangalore, India. Invited speaker. June 22-26 2015. Les Diablerets, Switzerland. Invited speaker. April 7-8 2015. Dijon, France. Co-organized with D. Mégy (nancy) and J. Nagel (Dijon).Co-funded by the ANR Project "BirPol". March 5-8 2015. Kwansei Gakuin University, Osaka, Japan. Invited speaker. Conference Complex Geometry, Analysis and Foliations, Honouring the memory of Marco Brunella. September 29 - October 3 2014. ICTP Trieste, Italy. Co-organized with with C. Arezzo (ICTP), L. Meersseman (Angers) and J.V. Pereira (IMPA). December 9-11 2014. Dijon, France.Co-organized with L. Moser-Jauslin (Dijon). Co-funded by the ANR Project "BirPol"
July 14-25, 2014. Chern Institute of Mathematics, Nankai University, Tianjin, China. Member of the Academic Committe with H. Bass and H. Derksen (Michigan), L. Makar-Limanov (Wayne State), D. Wright (Washington) and Z. Tang (Suzhou). Lecturer for the short school in first week. July 7-11, 2014. RIMS Kyoto, Japan. June 23-27, 2014. Lyon, France. Invited Speaker. June 2-6, 2014. Angers, France. Co-funded by the ANR Project "BirPol". Sadly conflicting with the Conference On Affine Algebraic Geometry in honour of Hanspeter Kraft, Basel, Switzerland. September 17-20 2013. Dijon, France. Co-organized with L. Moser-Jauslin and C. Petitjean (Dijon) as part of the ANR Project "BirPol". October 29 - November 3, 2012. CIRM Levico terme, Italy. Co-funded by the ANR Project "BirPol". Invited Speaker. September 21-28, 2012. CRM Montréal, Canada. May 23-25, 2012. Dijon, France. Co-organized with J. Nagel. Co-funded by the ANR Project "BirPol". April 23–27, 2012. Steklov Mathematical Institute of RAS, Moscow, Russia. Invited Speaker. November 20-26 2011, Oberwolfach, Germany. Co-organized with H. Flenner (Bochum) and H. Kraft (Basel). June 20-22, 2011. Basel, Switzerland. Invited Speaker. December 6-10, 2010. Indian Institute of Science, Bangalore, India. Invited Speaker. June 16-19, 2010. Warwick Mathematics Insitute, Warwick, UK. Invited Speaker. July 6-10, 2009. Radboud University Nijmegen, The Netherlands. Speaker. January 31 - February 2, 2008. Dijon, France. Co-organized with L. Moser-Jauslin. January 7-13, 2007. Oberwolfach, Germany. Archives of older activities or projects. Study Group "Categorical operations of Braid Groups"
A study group organized at the Institut de Mathématiques de Bourgogne (Dijon) by Emmanuel Wagner and Daniele Faenzi during the year 2015-2016. Joint Study Group "Intersection Cohomology and Perverse Sheaves"
A study group organized jointly between the Institut de Mathématiques de Bourgogne (Dijon) and the Institut Élie Cartan (Nancy) by Jan Nagel and Damien Mégy whose sessions took place alternatively in Dijon and Nancy during fall and winter 2014-2015. A closing conference " Perverse sheaves and Applications was organized in Dijon on April 7-8 2005. Archives of the French-Swiss study group Automorphismes des Espaces Affines for the period 2006-2012. Archives of the meetings of the ANR Project "Complexe" in Lyon, Strasbourg and Nice, 2010-2011. Archives of the study group Théorie A1-topologique des variétés algébriques, Dijon, 2011-2012. Archives of the study group Flips en dimension 3, Dijon, 2008-2009.